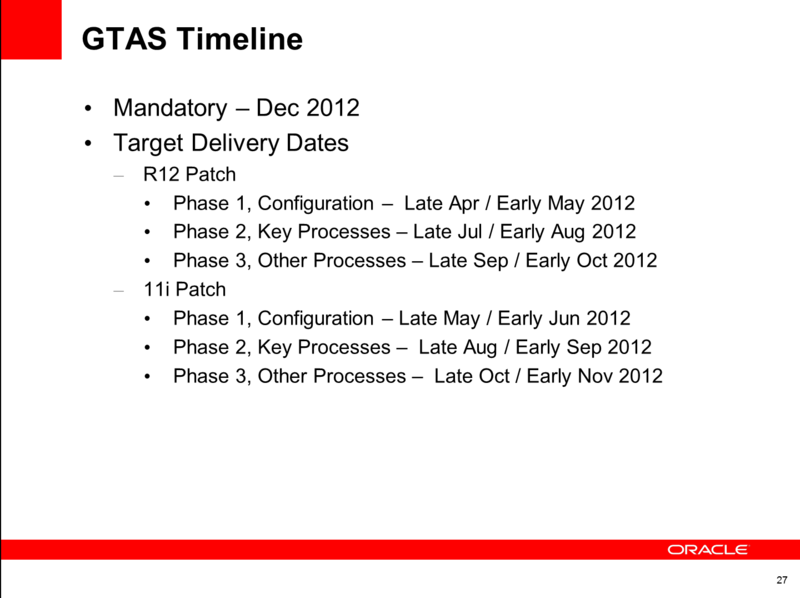 I didn’t attend, but there was an Oracle Federal Financial Briefing on 17-Apr in Reston where information was shared about some of the upcoming GTAS enhancements and target patch release dates. Personally, besides focusing on our Fed R12.1.3 stabilization efforts on my current gig, I’m working to get smart on some of the basics associated with GTAS, the upcoming 6-digit USSGL standard and new Federal Accounting/System process changes associated. As soon as we can get our hands on these new GTAS patches, we need to jump on them to start understanding some of the impacts to our EBS environments in further detail. As the Federal E-Business Suite community, we don’t really have much time to be able digest, test and prepare for these changes. First required reporting cycle for GTAS is after Nov FY13 month-end (Calendar Nov 2012) and the fact that GTAS will only accept Bulk File feeds (i.e. no pencil whipping any numbers like with FACTS today), means we’ve got to be ready with this stuff working. If anyone is looking for more info from Treasury on GTAS, you can find it here. For R12 Fed Financials Installs who jumped on the CGAC & FV 90000001 patches early (me and my local Denver Federal Financials Shared Service provider! ), at least we have that piece behind us. But certainly there is more coming, especially for all the agencies still on 11i. If you’ve been following the twitter feed, you know I’m heading to Collaborate ’12 to present two Federal Financials R12 sessions and catch-up on as much news/info as I can there. The FED Sig meeting is on Monday, maybe that will help. Keep watch on the twitter feed for anything I pick up relevant to the Federal EBS community. If anyone has any comments or knowledge to share that you feel would help spread key info, please don’t hesitate to comment. The above link runs a system check to see if you have everything installed in order to run the virtual expo, but should auto resolve to the Forum page after about 5 seconds.